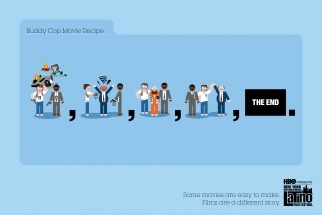 In a campaign through WPP's Wing, the HBO New York International Latino Film Festival (NYLIFF) illustrates just how predictable big budget Hollywood movies are, by visualizing the tired old formulas they stitch together. 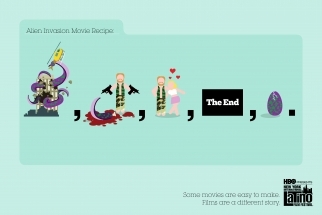 The campaign consists of a series of print ads, plus animations for TV and Web (developed in partnership with Click 3X), and an on-line game, all of which satirize six types of movie - Alien Invasion, Sports Comeback, Serial Killer, Chick Flick, and Buddy Cop. 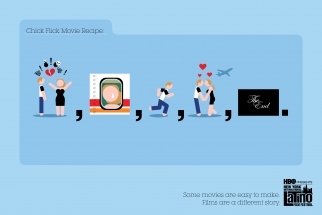 The tagline is "some movies are easy to make, films are a different story." Ads will run in both Spanish and English on NBC, Telemundo, and in movie theatres throughout New York promoting the film festival, which runs from August 13-19.